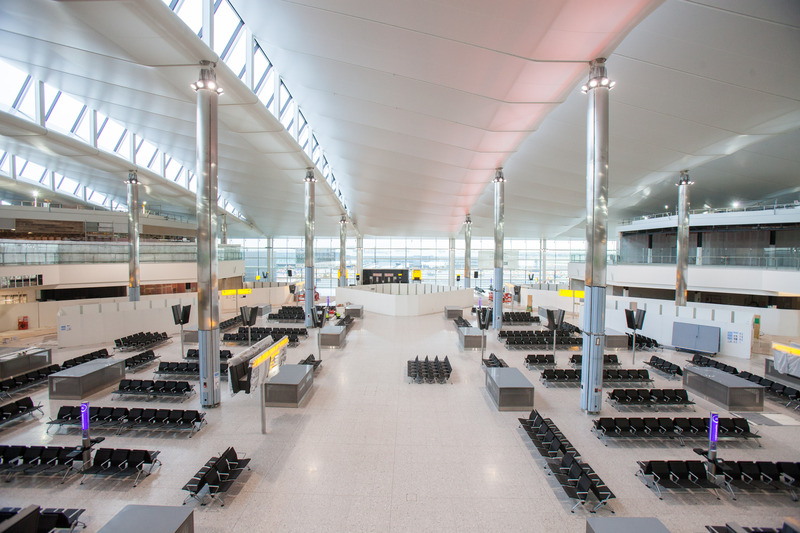 Over the past few years, thedesignair.net team based in London have seen the 1955 version of Terminal 2 get knocked down and rebuilt ready for 2014, and its now starting to become one of the best examples of terminal architecture the UK have seen for a while. They say the devil is in the detail, and that is apparent here. LVA (Luis Vidal) has created this terminal as a destination into itself, attracting passengers to the terminal earlier than their departure time in order to spend time, enjoy the welcoming atmosphere and have experiences with the wide range of amenities, services and retail the airport has to offer. In short, Terminal 2 will make the passengers feel as relaxed as if they were at home. 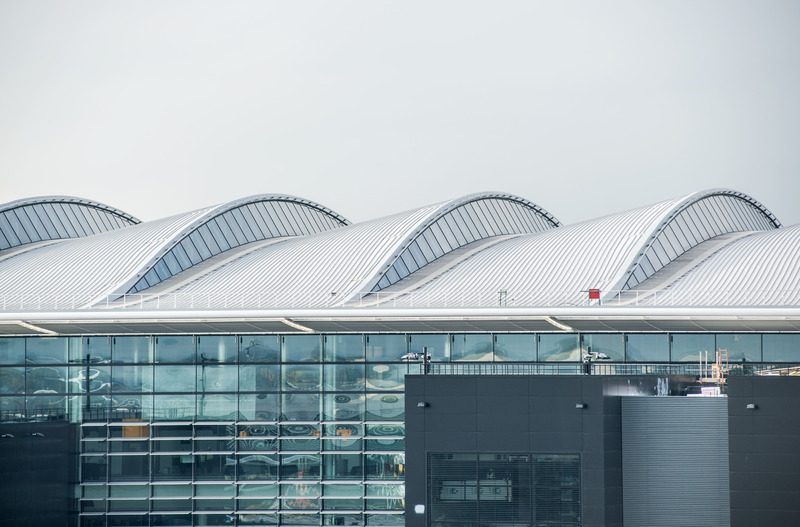 The roof is the prominent and most recognizable feature of Terminal 2. Conceived as a lightweight structure resembling early airplanes, this feature is unique and this floating, undulating enclosure serves three different purposes. 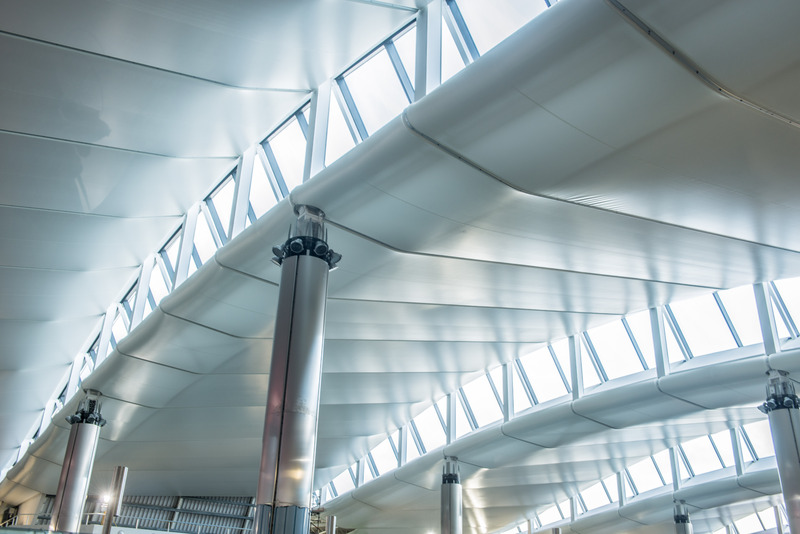 To serve as markers between check-in, security and the departure lounge, to provide steady light quality and to utalize natural light from the north to reduce the carbon footprint of the terminal. Costing £2.5bn the terminal, which will serve 20million passengers per year is built with sustanability in mind. 20% of the terminals energy needs will be from renewable sources. offer one square kilometre of solar panels and is expected to save around 13,000 tonnes of CO2 a year compared to the use of natural gas and grid electricity. Approximately 600 Security Officers, 30 Passenger Service Ambassadors and 70 Service Team Leaders. We hope to have a full interview with Luis Vidal in the upcoming months about his vision for Heathrow’s latest groundbreaking terminal. In the meantime, check out our images below (courtesy of photolibrary.heathrow.com) to whet your appetite prior to the opening, June 4th 2014. We love the details! The new terminal 2 building is no doubt a great leap forward for Heathrow, building on the learning from terminal 5. What is worrying for me about the reporting for this particular building in the media, like this article, is the apparent lack of understanding by many about the Vidal component, the main terminal, and the rest of the eastern campus projects, like the Covered court, Carpark, VPM and of course Concourse B which have been undertaken by the likes of Grimshaw and Aedus with no Vidal input. Even more worrying is the use of images in the articles from the Terminal 2 concourse B project, seemingly attributed to or left to the reader to assume are of Luis Vidal’s work. In the linked article, 6 of the 15 images are of concourse B, and 1 of the entry from carpark to covered court. furthermore the article claims the use of timber was reference/nod to Luis Vidal’s Barajas terminal, and reinforces the use by illustrating a concourse B image, when in fact it had been designed, selected and installed in the concourse B stage 1 well before the Terminal 2 project, I am not aware of substantial use of Timber within terminal 2. I only write here as the other design and construction teams are equally pleased by our efforts a to produce the Concourse, VPM, Carpark and Covered court projects which augment the good work done on the main terminal Building and hope we will be attributed rightly for the work we undertook. Thanks for this, you aren’t the first person to contact us regarding this, we are piecing together the full story from a variety of sources now to get a bigger picture and will do a new story shortly! Now how about doing a review of the better Building. The concourse!